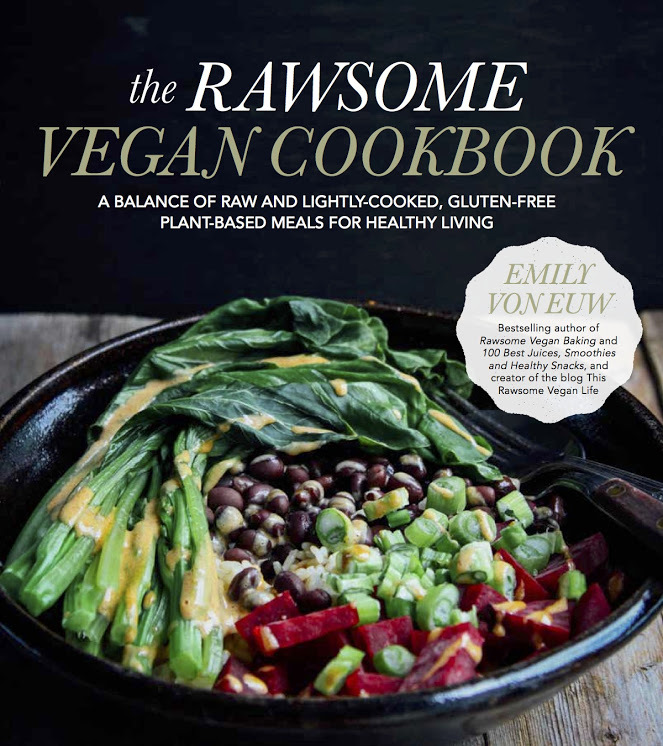 check out Emily’s Rawsome Vegan Cookbook! Snow has finally hit my city and never have I been more glad to be able to work from home. Every now and then I long for more social interaction and your typical coworker chitchat, but I’m perfectly happy to stay at home, work from the safety of my little apartment and watch the snow flurry around the little people and cars below. Especially this week. Everyone around me seems to be getting sick. My brother’s sick, my baby cousin (whom you might have seen in my Snapchat stories), my coworker’s kids are sick, and now, I’m sick. I’m creating a snot-monster tissue pile every hour or so that I continue to clear off into the waste-basket but it always comes back. Despite me feeling under the weather, I’ve been trying to truck along and cook some of my favourite things from Emily’s Rawsome Vegan Cookbook. Most of the recipes are ultra simple and have made me appreciate veggies and their unique flavours in ways that I’m not used to. Initially I had a lot of trouble adjusting to the recipes that Emily makes because they were almost too simple. (I know, it’s an odd criticism). Emily’s cookbook is full of stunning photography that inspires you to shop more at your local farmer’s market and take advantage of the simplicity of fresh, locally grown ingredients. Heirloom tomatoes, morels, arugula greens, radish greens, there are lots of lush-looking recipes that explain why Emily always looks so happy in their photos. What I think is great about this cookbook is that the recipes are an accurate representation of all the things Emily finds comforting in food. Leafy greens, Asian-inspired recipes, colourful assortments of veggies, and of course, lots of sweet potato! One of their recipes was simply roasted sweet potatoes with some tahini, lemon juice, and black pepper, and at a glance I thought, that’s just too simple. But I tried it anyway. You know what? It was pretty good. 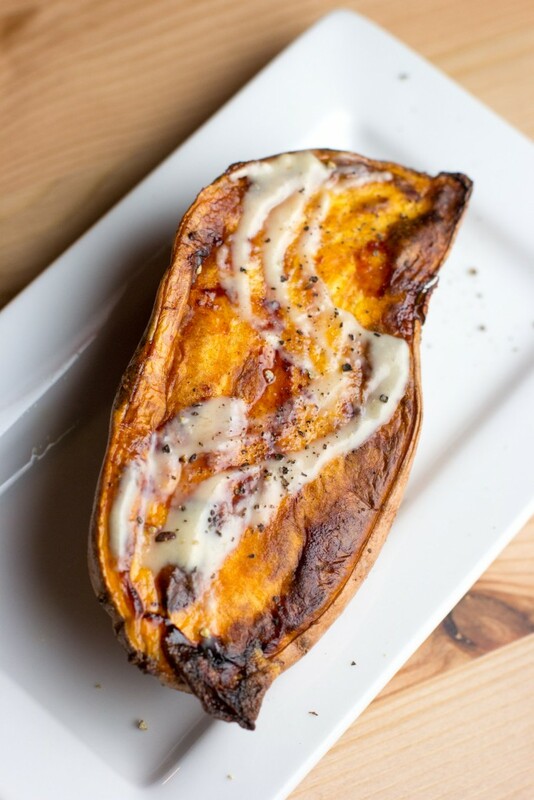 It makes a great side that’s simple and highlights the flavour of sweet potato. I forgot how much I liked simply roasted sweet potato—it’s super creamy and sweet. My grandparents keep around a little dish of steamed sweet potatoes all the time to snack on and I would grab one every now and then if I were desperately hungry and there was nothing vegan around to eat, so I associated simple sweet potato as a last resort. 6/10 would eat again probably with some other things to satiate my inclination for different textures. Don’t get me wrong, sweet potato in a dish has always been delicious to me. Sweet potato soup is undeniably delicious, I have a recipe for one from my vegetarian days, but I have small amends for keeping the recipe vegan. But aside from flavouring things to be specifically sweet-potato flavoured, I didn’t think to use sweet potato as the base for a creamy mac and cheese. WHOA. Creamy, vibrant, sweet and comforting. Obviously it tastes like sweet potato, but it’s just as comforting as any other mac and cheese recipe out there. I couldn’t use cashew butter, so I used tahini instead and it was unreal! So good. 10/10 would eat again. 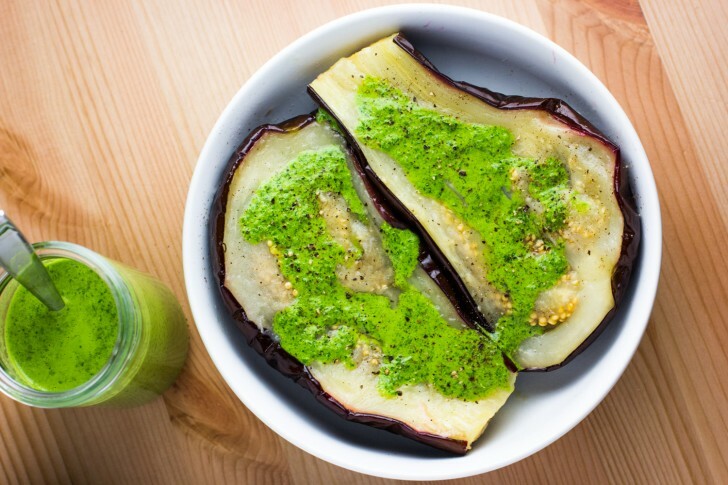 After enjoying some falafel, tabbouleh, and delicious eggplant dishes at this local Middle-Eastern place, I’ve been craving some more eggplant. I probably should have roasted this a little bit longer, but I was getting hangry so I pulled it out and drizzled some herby deliciousness on top. It was creamy, soft, sweet, and simple. I’d recommend again serving this as a side, but it was pretty good. 5/10 I might eat again once I figure out how to roast eggplant properly haha. Next up is Emily’s version of Som Tam—which is a green papaya salad. Their simplified version of this traditional Thai recipe is sweet and simple, with lots of crunch and citrus flavour, but having grown up eating mango salad, papaya salad, I know my way around a mortar and pestle. I modified the recipe slightly, but Emily’s version is sweet, simple, and easy. 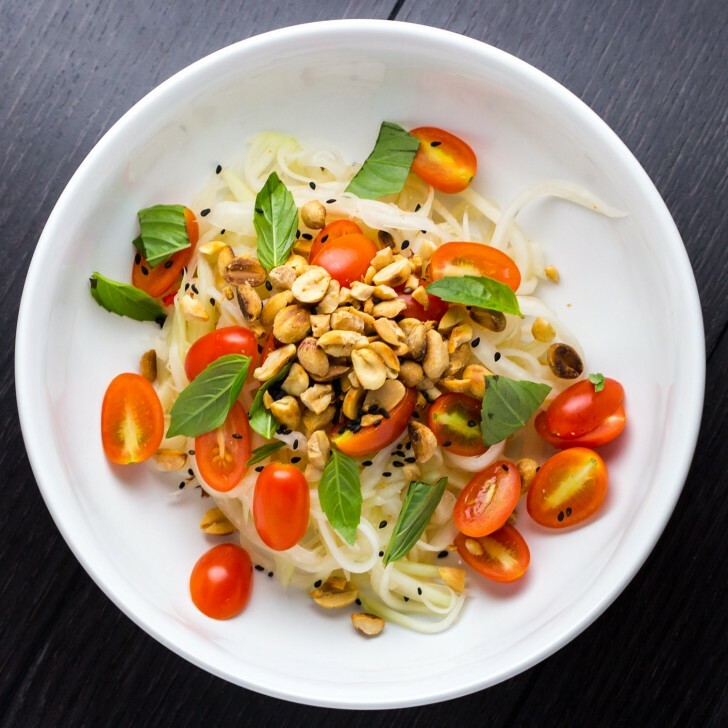 I love green papaya salad, with a balance of sweet, spicy, salty, and garlicky! The rest of Emily’s recipes are vibrant and full of plant-based goodness. Lots of them require a high-speed blender, but I don’t so that might limit your success with the cookbook like it did for me. I also like a lot of spices, so I found that I was adding a little extra to some of the recipes I tried, but it’s up to you. Here’s my modified version of Emily’s Som Tam, with plenty of crushed peanuts and garlicky chilli heat. In Vietnam you can find it served with beef jerky, but I’ve added Gardein’s Beefless ground seasoned with some dark mushroom sauce to help temper the heat. Peel papaya and prepare into thin strips. You can slice by hand or carefully use a mandoline slicer until you get to the seedy core. Once you start hitting the seeds, use a knife to slice the top and bottom of the papaya to get as much of the fruit as you can. 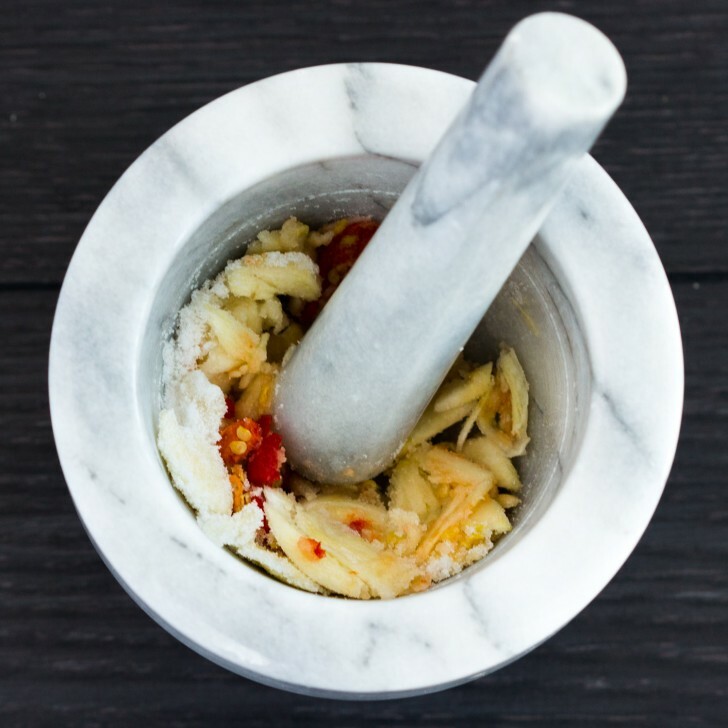 Using a mortar and pestle, mash garlic, chillies, sugar, and salt together until you get a paste. Add the fermented liquid and lime juice, and stir to combine. Pour over the sliced green papaya and toss to combine. I like to wear vinyl gloves to squeeze and mix everything by hand. It's traditionally all done in a large Thai version of a mortar and pestle, but I don't have that so I do it by hand. Wear gloves, otherwise your hands will have the chilli oil on them and that's no fun, especially if you have cracked hands or cuts like me. Serve the salad with some roasted unsalted peanuts, grape tomatoes, torn basil, and a dash of sesame seeds. if you can't handle heat, bring it down to just one for a wee kick, or kick it up to 3 or 4 if you like it spicy! 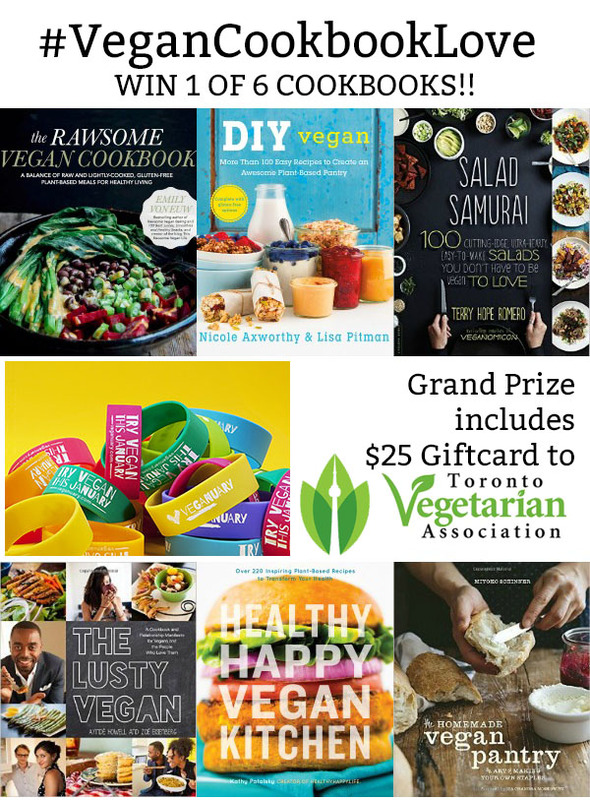 Make sure you check out Joann’s blog, Woman in Real Life to see what she cooked up for #VeganCookbookLove this week!